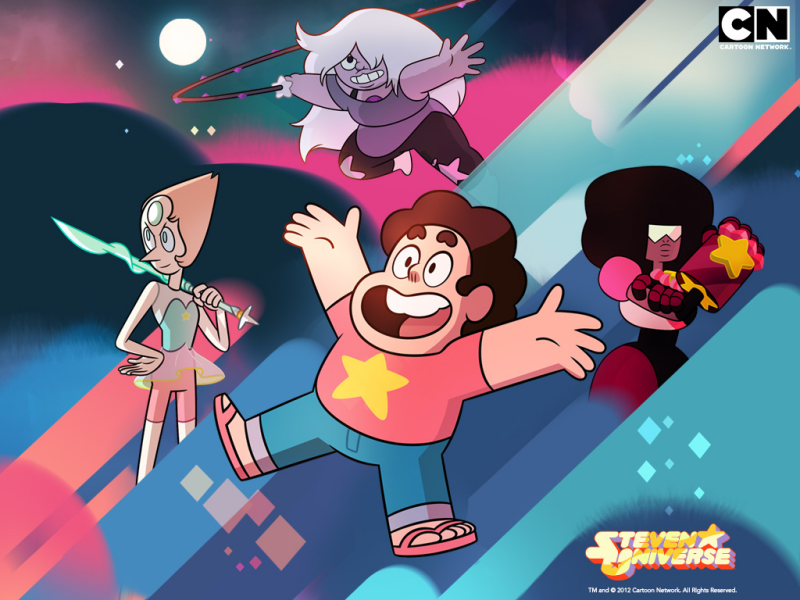 Rebecca Sugar's Cartoon Network series Steven Universe has gotten a lot of praise around the internet for its positive portrayals of racial and gender diversity, its healthy life lessons and its sophisticated character drama, all of which is fair, but it might not be half as memorable and compelling a series if its sweetness wasn't contrasted so starkly against both a painful tearjerker side and some pretty dark existential horror facets. As a Halloween post, you know which one we're focusing on. 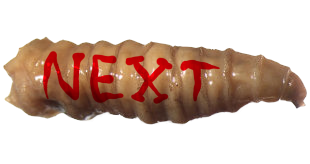 We'll start with the least frightening, but still borderline creepy thing in the "top ten" we're basically doing here. 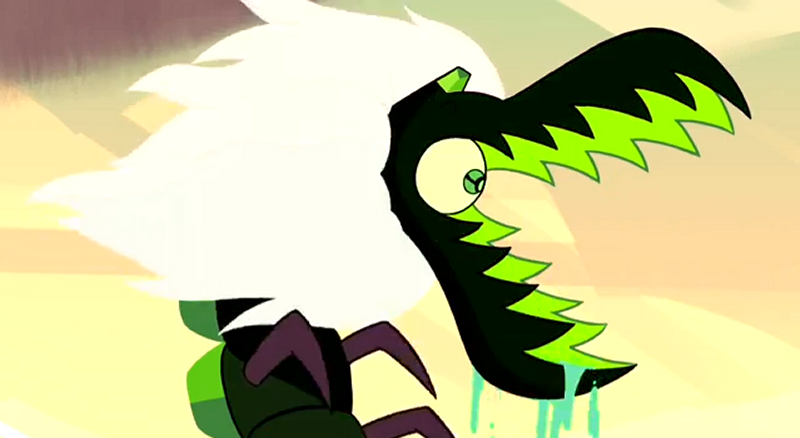 As a hybrid of a human and a gem, Steven's shaky control over his magical powers is a repeating theme throughout the show, and one of those powers is his healing saliva. 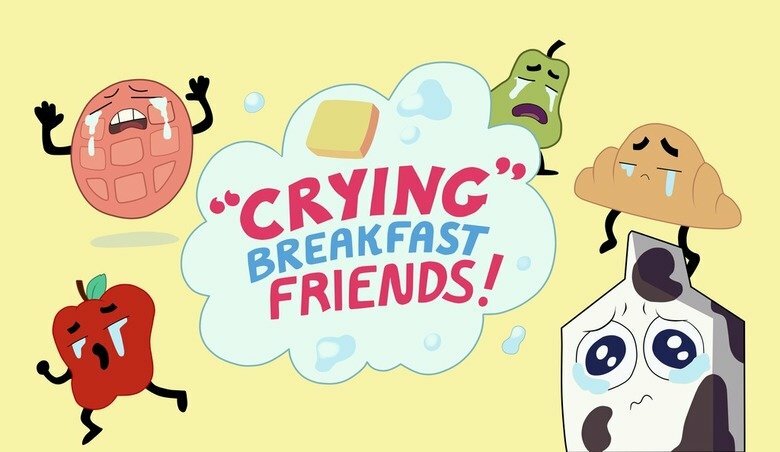 After eating an ordinary watermelon and spitting out the seeds, Steven accidentally grows a crop of crude, Steven-shaped fruit doppelgangers, which would be a cutesy thing in any other kid's show, but here, they're written to be unsettling and bizarre. They're silent, staring, imperfect vegetable dolls, and eventually, they even turn violent. 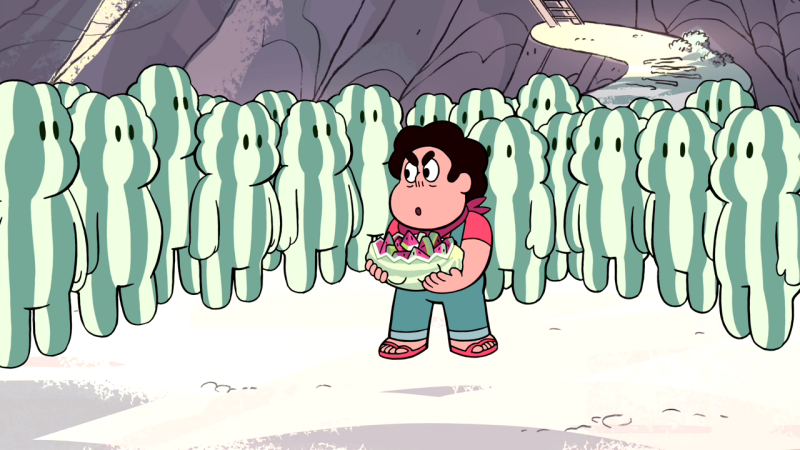 The watermelon Stevens eventually end their rampage and willingly march off into the sea, apparently colonizing an island we'll be seeing in an upcoming episode. The first time we ever see the Crystal Gems in action, they're busy exterminating a family of acid-spewing "Centipeetles," and more monsters will crop up throughout the first season, varying from oversized birds and fish to more alien forms. For a long time, we're seemingly expected to just take these creatures at face value. If magical, mineral-based aliens exist, then all sorts of monsters must end up on our planet, right? 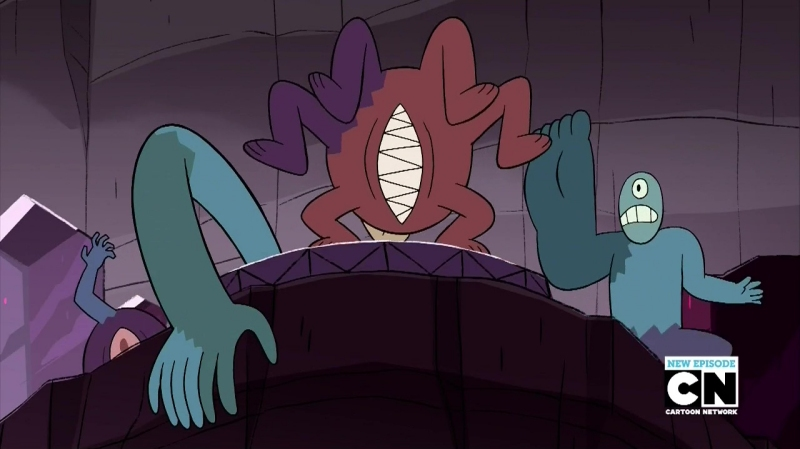 It isn't until well into the series that Pearl finally explains these beings as gems themselves that have gone "corrupt." What this "corruption" truly means and how it happens, we still haven't been told. As far as we know, gems in their natural state are mineral organisms projecting a humanoid body, highly intelligent, highly cognizant and always in control. How and why some of them seem to lose their minds and take on forms such as eyeless birds, stone echinoderms, gelatinous tardigrades and even inanimate objects remains a mystery, but then, we don't even know why the gems appear in humanoid forms at all, either. They can look like anything they want, so their anthropomorphic bodies already have to be some sort of "mimicry," right? Corrupt gems could turn to imitating other life forms, and perhaps not necessarily life forms from our own planet. Could these "monsters" be racial memories of things encountered throughout the cosmos? 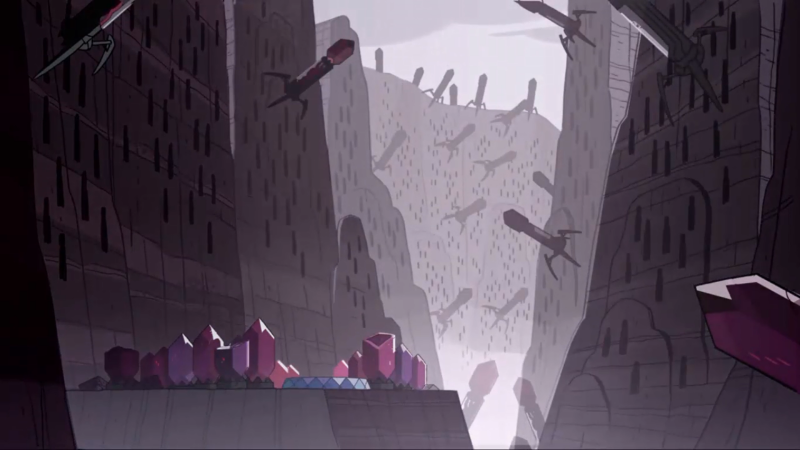 Things gems have conquered throughout the cosmos? 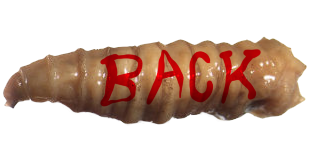 All we do know is that a small part of them, deep inside, retains some dim memory of their original lives, and Steven is eventually even able to resurrect and "tame" the first episode's Centipeetle. Corrupt Gems aren't all individually as creepy as the implications behind their origins, so I'll be waiting until after the Halloween season to review them one-by-one. 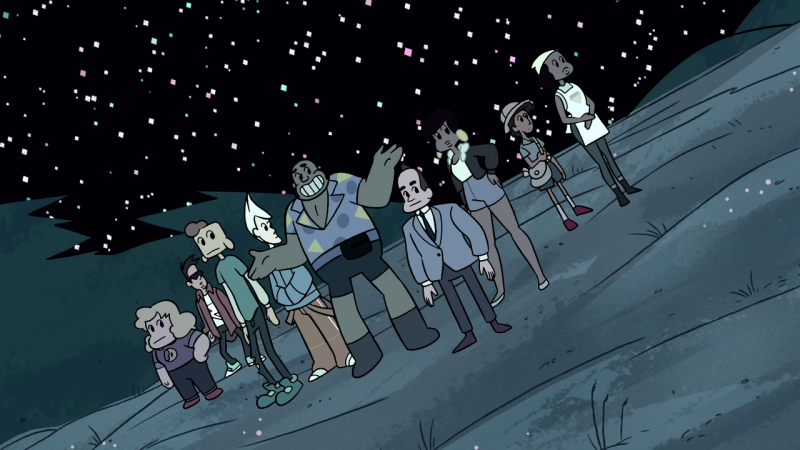 One particular "corrupted" gem is easily worthy of its own entry here, however, when Beach City's old lighthouse appears to be "haunted" during a Halloween episode. Like most of Earth's spirits, monsters and myths seem to be, the poltergeist is really of gem origin, one which somehow merged into the foundations of a building and has lashed out in dim, confused attempts to communicate. Reflecting the emotions of the humans inhabiting it, the "haunted" lighthouse even manifests a hideous, gigantic mouth and attempts to devour Lars, the ex-best-friend of one of its current residents, Ronaldo. Steven can never be certain how well gem magic is going to work out for him; even magic left him by his mother, Rose Quartz, who had to sacrifice her own existence to bring her hybrid child into the world. One of the many alien technologies Rose left behind was a room that could effectively grant Steven any wish he wanted, but when he finally stumbles upon it, he accidentally wishes himself into a false, magical facsimile of his town. Nothing quite works the way it's supposed to, and his friends, family and neighbors both behave in repetitive, pre-programmed ways and slowly lose their life-like details as the logic of the simulated town deteriorates. 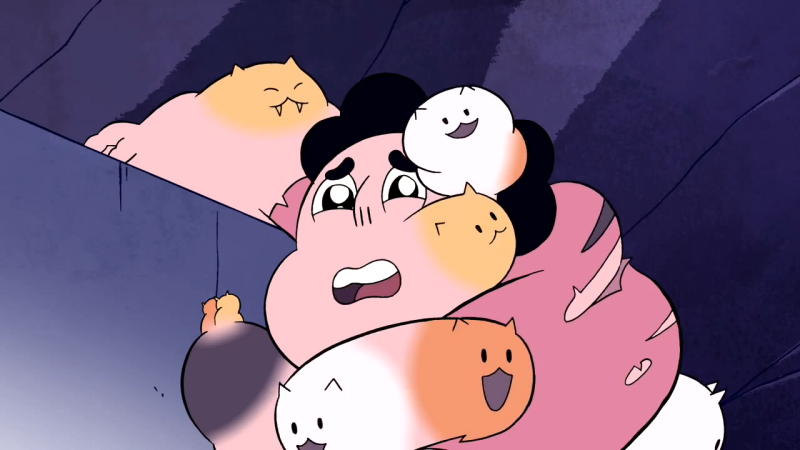 Most gems have the ability to shape-shift at will - some seemingly more than others - but Steven's only experimentation with this power, thus far, was when he learned to turn his fingers into adorable little kittens. It seemed like just a fun trick, if a little unnerving to his fully human father, until Steven began to lose control of the ability, darling kitties multiplying uncontrollably from his flesh until he erupted Akira-style into a pulsing mountain of extraneous bodies. Only the hatred cats hold for getting wet saved Steven from becoming some sort of catscape, and he's yet to risk toying with the power ever since. Turning into a huge blob of kittens is another thing that other cartoons might have handled for pure comedy, but here, it's treated as it would be in real life, simply too unearthly and dangerous to just be a joke. The ability for two or more gems to fuse into one new, larger body is an increasingly important aspect of the series, and for at least the gems who raise and protect Steven, fusion is normally an extremely personal and intimate act. This is only one reason it's so unsettling when a brutal and malevolent gem, Jasper, fuses with the more sympathetic Lapis Lazuli, resulting in the chimeric Malachite. 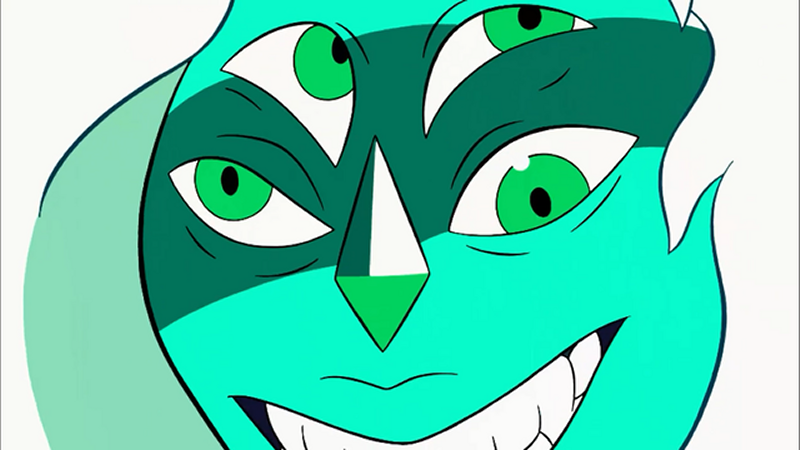 Even our protagonist gems have some rather monstrous fusion forms, but Malachite is more "off" than usual, and we see why when she abruptly turns against herself. Normally, a gem fusion is more or less a single, seamless being, and will disassemble if its component gems are at odds with one another. Mustering all her concentration, Lapis maintains a level of independence without breaking the fusion, using her control over water to bind Malachite and drag her to the bottom of the ocean. 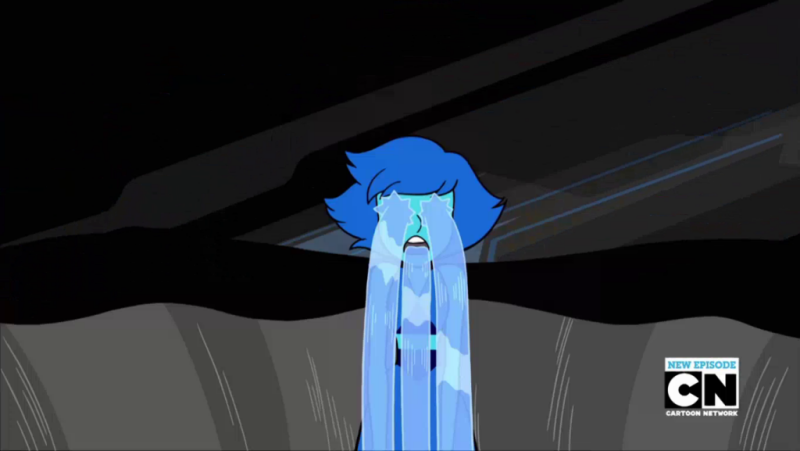 Currently, Malachite is still imprisoned somewhere deep in the sea, but a part of Lapis has been sending messages to Steven in his sleep, mostly manifesting as surreal nightmares, like this lovely moment. One of our first clues that gems aren't entirely what they seem comes when we visit one of their reproductive sites. What gems refer to as "kindergartens" are indeed places where new gems are born and raised, but the rows and rows of human-shaped holes they emerged from - straight out of Junji Ito - is anything but cute, and the nesting grounds are ominously littered with huge, deactivated machines patterned after bacteriophages. Assuming not all of you reading this are completely familiar with microbiology or read any other part of this website, those things are designed after viruses, which inject genetic material into bacterial cells and destroy them from within as they replicate. As we can surmise - and dialog has all but confirmed in episodes since - gems are more or less a parasitic mineral race, expending the resources of entire planets to perpetuate their kind. 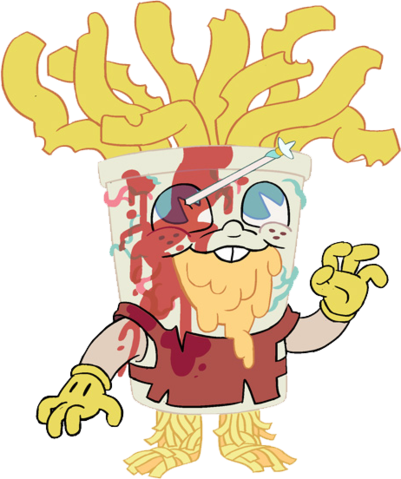 Formerly agreed upon as the most terrifying thing to ever grace the series, if not any Cartoon Network program, Frybo is the mascot of Beach City's most popular french fry stand, and uncanny enough as a harmless, tacky costume. Steven, unfortunately, takes one look at the ghoulish thing and thinks it would be a great idea to bring it to life with a gem artifact, allowing his friend to skip out on having to wearing it himself. Leaving the animated suit with the command to "get people to eat fries" is his second big mistake, as the potato-headed goblin grows increasingly powerful and increasingly aggressive. ...Have you considered that you're wrong? 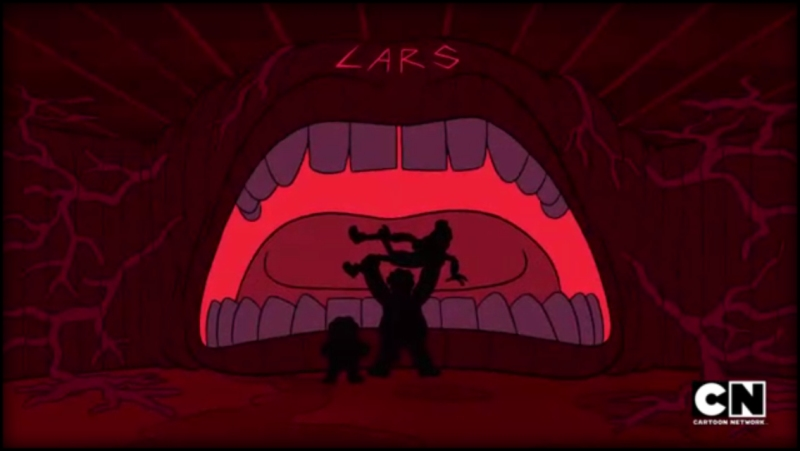 We mentioned earlier how the show's core gem characters regard the power to fuse as their deepest expression of love, so you can only imagine the horror they must feel when they discover the long-buried scientific experiments their own kind have left buried in our planet's crust; broken shards of dead gems, artificially fused against their will into new configurations. 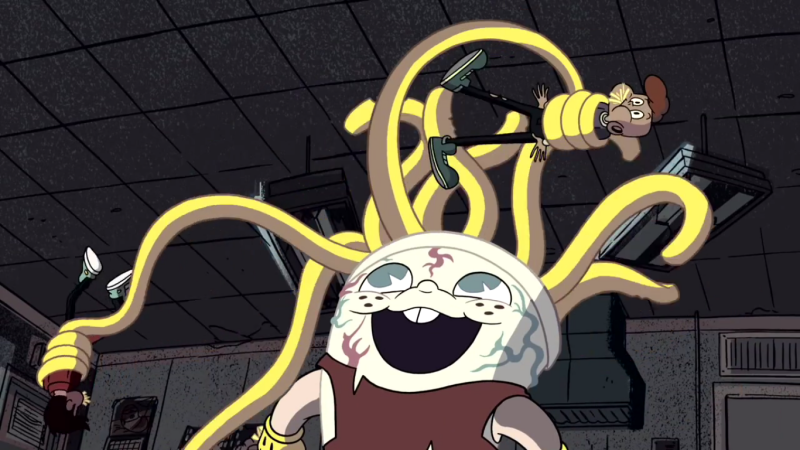 The first of these abominations we witness are only arms, legs and hands merged together into pitiful, floundering clumps, but one especially large specimen immediately attempts to pry Garnet apart, a character earlier revealed to be the long-term fusion of two gems in love, and too sickened by the existence of these monsters to even fight back until Steven intervenes. 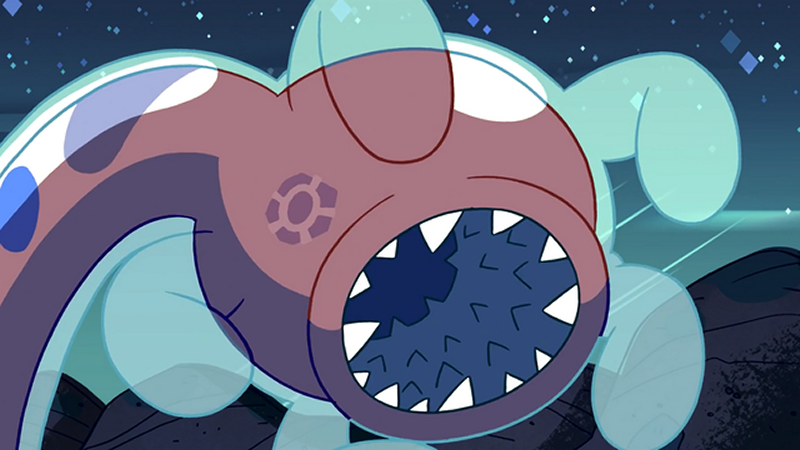 Referred to by Steven as "gem mutants" and by production notes as "cluster gems," we've seen many more of these creatures in many more configurations, all of them mindlessly destructive and perpetually wailing in apparent torment. One of the most interesting since has been this saw-toothed lump, possessing a bloodshot eyeball inside its yonic mouth. These Frankensteinian hybrids, however, don't even exist for an immediate purpose in their own right, but are soon revealed to be no more than the by-products of experimental prototypes. As we now know, a mass of gem shards are slumbering deeper beneath the planet's surface, and their clustered fusion form would be large enough for our whole world to be no more than its "egg." This is the revelation we last left off shortly before I started this post, and we can't even speculate what sort of form the ultimate cluster might take. All we know is that this series isn't close to finished giving children (and plenty of adults) delightful new nightmares to worry about. Not bad for a show whose first episode was about Steven wanting ice cream bars.